“Hot with butter or cold with mayo?” asked the waitress as she took my order. Oh, that all of life’s decisions could be so win-win. 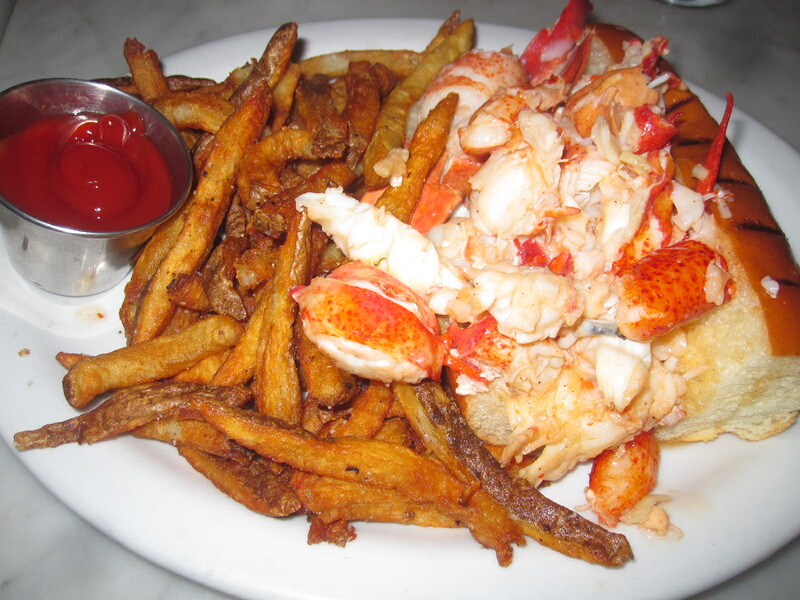 Alas, they rarely are but for at least one night, when I ordered the lobster roll at Neptune Oyster in Boston’s North End, that’s precisely what they were. While I don’t doubt that the cold-with-mayo option would have been delicious— the creamy tangyness of the mayo playing off the sweet, juicy lobster meat— it was a cold and blustery night and that called for hot. With butter. What came from the kitchen and was placed before me didn’t just warm me with its temperature but with the fuzzy feeling of gluttonous happiness it spread inside of me. The soft toasted roll was practically an open faced sandwich, with fat chunks of tender lobster meat piled high and spilling out over sides, glistening under a golden coat of warm, melted butter. Each bite was rich and buttery, sweet and savory in the way that lobster always is. I ate lots of good stuff in Boston but the lobster roll might have been the best. A great dish at a great restaurant. Win- win. This entry was posted in Dinner and tagged Boston, butter, lobster, lobster roll, Neptune Oyster, North End. Bookmark the permalink. a table for two, one lobster roll, one sundae and, oh yeah, about half a dozen fried oysters at pearl are calling our names. for real, like next week.